A re-mastered collection of NOOTHGRUSH’s mid 90’s best recordings. Includes the very rare and limited split vinyls with Gasp, Suppression, Carol Ann, Wellington and Corrupted. Plus a good bunch of re-arranged and unreleased stuff. Comes packed in a very neat inside-out printed piece of deluxe digipack with envelope containing a 12 pages comprehensive booklet. This is a reissue of the 2006 Throne Records original jewel case CD release, which includes unreleased artwork and updated info. 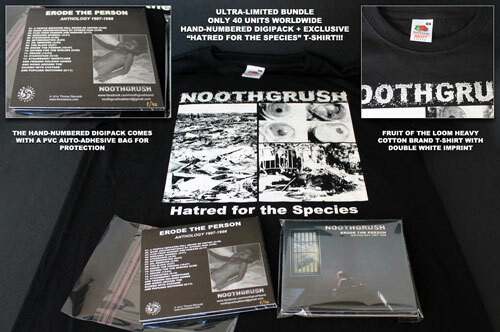 Limited to 460 copies, per-orders for the CD are available HERE, while an ultra-limited collectors bundle of 40 units which includes the CD with a ‘Hatred For The Species’ T-Shirt is available HERE. Originally released by Throne in 2008, it was about time for a repress. This is the Japanese Sludge cult band CORRUPTED‘s official debut. The audio has been remastered from the original tapes. 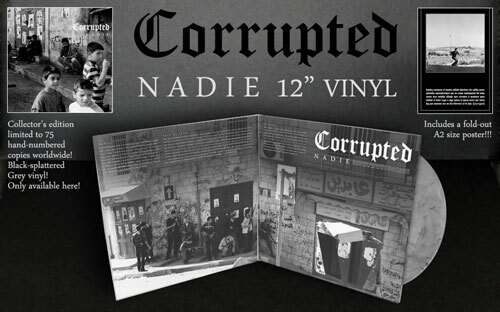 Whole artwork (including a fold-out A2 size poster) is exclusively arranged using a war-reporter’s unique exclusive pictures shot at Palestina. Pressed at 45 rpm for maximum performance. This is a sought-after CORRUPTED release. Initial pressing of 1000 copies back in 2008 sold-out within weeks, now a highly priced collectable release. Without bands like CORRUPTED, successful modern bands of the genre would not sound the same, as CORRUPTED are an avant-garde band which expanded both sound/tuning and timing to the extreme. Often imitated, few times matched. Limited to just 75 hand number copies on black splattered grey vinyl and per-orders are available HERE. This nice piece of vinyl was supposed to be the last Throne release ever (hence its reference throne 11), which eventually never happened. 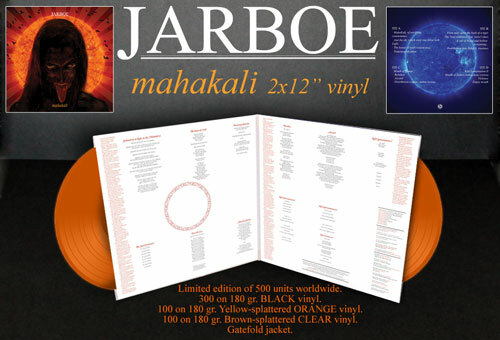 Now that the label is back on track, this highly anticipated vinyl edition of the majestic JARBOE‘s album is available in a very limited one and only edition of 500 copies worldwide, split into 3 different vinyl colors. For the first time in vinyl format, this full length is claimed to be one of JARBOE‘s best releases. The group chosen for Mahakali includes all three members of DYSRHYTMIA as well as JOSH GRAHAM (Red Sparrowes, A Storm Of Light, Neurosis). It also includes the perfomance of PHIL ANSELMO (Pantera, Down) ATTILA CSIHAR (Mayhem, Gravetemple), and KRIS FORCE (Amber Asylum). JARBOE is considered a true independent artist of the 21st century experimental music. She has released 18 solo albums in addition to working on more than 20 SWANS albums and more than 60 collaborative projects with visual and sound artists all over the world.